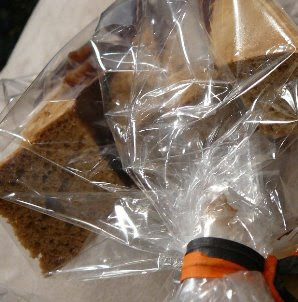 When making biscotti, they need to be eaten within the day, or sealed in an air-tight container. I find they absorb moisture very quickly, probably b/c they're already so dry. These biscotti turned out more biscotti-like than my last batch, since butter was omitted from the recipe, resulting in a product that was less shortbread-ish. I'm not a huge fan of the green tea flavor- will probably just stick to more traditional almonds, white chocolate, and orange combinations next time. Beat in flour mixture into eggs + sugar. Add in almond slivers, and white chocolate chips (if desired). Bake at 300 degrees F for 35 minutes; remove, slice, cool down, and bake again 20-25 min. After cooled, dip in chocolate ganache and coat at an angle. Here they are in a gift bag- the chocolate melts rather quickly. They were yummy! Nicole and I both enjoyed them.